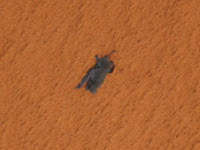 Nasa has released photos of a bat hanging onto the side of the shuttle as it took off earlier this week. A wildlife expert has looked at the footage and concluded that the bat was likely injured and could not come free of the shuttle. The crew on the ground had hoped it would wake up and fly away, but unfortunately that wasn't the case. Check out the photos on the NASA website.